Hair is the receiver and transmitter of divine emanation ­it makes you receptive to spiritual forces. Saints and sages instinctively let their hair grow. Rastafarians regard dredlocks as a quality of Black people: they regard dredlocks as "high-tension wires" which transmits divine energy and inspiration from Jah (God) the creator, to Rasta, the mirror. Within our body which is the temple of God, our head, the "holy of holies," is the highest point, while our hair, its natural crown, is like the spire of a church, our vertical connection with God. Representing our strength, it forms an antenna through which the SPIRitual force may descend. SPIRitual force, rather than "descend," will SPIRal through SPIRaling hair. Since Nature does nothing without a reason, what is the purpose and effect of spiral-hair? Since Nature itself is a textbook that reveals the secrets of the universe by literally expressing these principles in the actual form that something takes, my guess is that spiral-hair enhances the ability to tune in at the most detailed levels or dimensions; the micro within the macro. Both, nappy and straight haired people have "the whorl" or Big Spiral, and surely this allows tuning in at the "Big level," while the little spirals of individual strands additionally allow the antennae to pick up detail at the most minute level (?). Does hair antenna possess "accelerator" properties?. An accelerator is a device used by physicists to accelerate charged subatomic particles or nuclei to high energies useful for research. Two common types are the linear accelerator and the cyclotron. The linear type accelerates in a straight path that may be as long as two miles, while the cyclotron accelerates subatomic particles in a spiral path, and takes up way less space. Theoretically, energies being picked up by the antenna of hair, would be accelerated in a spiral or straight path depending on the type of hair. Throughout Nature, spiraling energy (whirlpools, eddies, tornados) manifests great speeds. Water going down a drain will spiral down the drain, picking up so much speed in the process that it becomes a suction. Energy flowing through spiral hair might also pick up extra speed, enhancing hair's antenna ability or even giving it new properties. Certainly, energy flowing through spiral hair would also spirally enter the millions of nervepaths leading to the brain and ultimately the "third eye," to facilitate spiritual awareness, telepathy, perception, revelation, channeling or tuning in, understanding, receptivity, thought, who knows? This area deserves research to determine and clarify the effect of spiraling hair on perception and energy reception/transmission. Melanin, which is a super absorber of all forms of energy, undoubtedly plays a huge role in this. Sensing this at some level, is this why whites call other whites who are blond, airheads ? ...or maybe the reverse is true! And the more concentrated, powerful, and advanced will be its abilities relating to the Spiral Principle. This is evident even physically, for nappy hair ­being a spring, will "snap" back to the head when pulled out and released. The more the spring is coiled, the more power it has and the less space it takes up (concentration). Right after nappy hair is vigorously brushed, the nappy hair which has accumulated in the brush holds far more electrical static charge than straight hair; thus like a magnet, it will attract light items ­paper for instance, whereas straight hair hardly or does not do this. 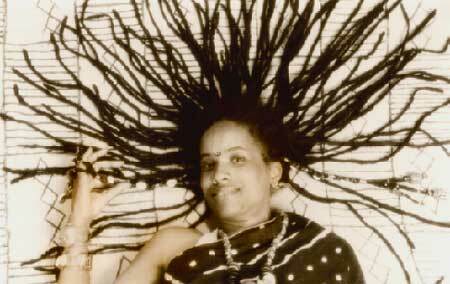 Possibly, this mean that spiral hair has higher magnetic attraction for higher energies. It may also have the ability to concentrate or focus these higher energies like a magnifying lens concentrate sunrays. Whatever abilities it has are surely increased or intensified, the nappier the hair is. Thus the nappiest hair, the hair which Afrikan people are conditioned to reject and despise the most, turns out to be the most valuable, like "the stone which the builders rejected" which turns out to be the most important stone. Crystals have the power to receive and transmit energy waves. The earliest radios used quartz crystals and were called "crystal sets." The main composition of quartz crystal is silicon. Silicon is also a key mineral found in the hair, and undoubtedly contributes to its antenna ability. It is no accident that silicon is also the most essential component of computers; silicon enables computers to have mind-like properties including "memory." Silicon is also an important mineral found in the brain, which is the seat of the mind. Silicon is what gives an iridescent sheen to some fruit such as strawberries and cucumbers. It is also found in whole barley and oats. The original meaning for the Chinese character, CHEN is 'a bushy head of hair' and 'divine influences.' 1 Understanding how the two (hair and divine energy) are connected, no wonder they were represented by a common word. 1) H. Moran /D. Kelly, The Alphabet & the Ancient Calendar Sign, 110.